Between March 30th and April 7th, 2015 the world saw three major character actors of pop-culture and also cult fame leave their mortal coil. As a child of the 80’s and 90’s these men left an impression of my mind. Robert Z’dar, he of the huge chin because of his birth defect aka cherubism was part of some of my favorite films, and played a cop, gangster, and more over the years. Z’dar actually had a pivotal role in my second favorite film TANGO & CASH in which his appearance was very important to the character and made him even more menacing. Tom Towles, a man who also played killers, cops and more, got his name out to the world in HENRY: Portrait of a Serial Killer, but made the most impact on me in the sci-fi horror THE BORROWER. Towles also became known better in later years as the cop in Rob Zombie’s horror films. Finally, James Best who became best known as Roscoe P. Coltrane, one of two antagonists on THE DUKES OF HAZZARD. Throughout the 50’s and 60s, Best was a regular guest star on many a western and crime drama ranging from The Lone Ranger to Perry Mason. 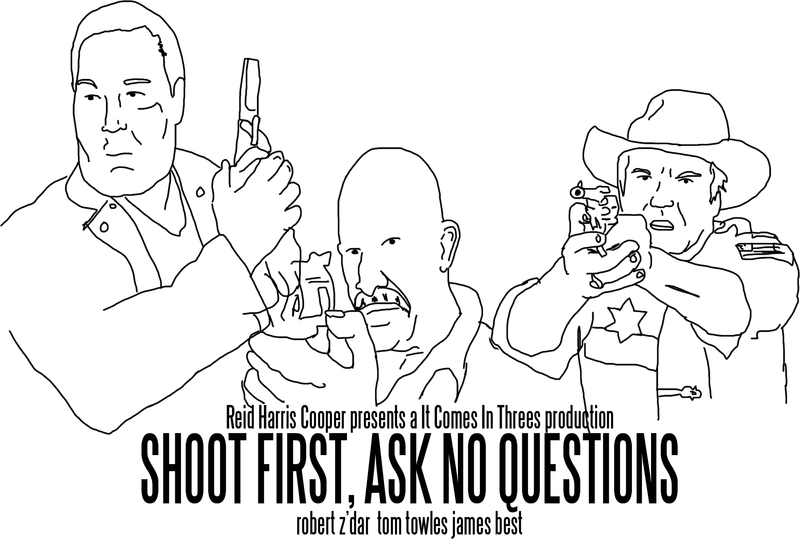 After Towles passing I envisioned he and Z’Dar meeting up in whatever afterlife may or may not exist for a comedy horror about two bungling cops who shoot first and never ask questions. I couldn’t get myself to draw it though. Then Best died and I felt he’d easily work in the fictional film/show and I knew I had to do something as a tribute. PCS does LOTS of art (most of it wrestling inspired) but rarely posts it here. I feel in honor of these three men I must share this tribute which is incomplete, but says everything I want it to say.